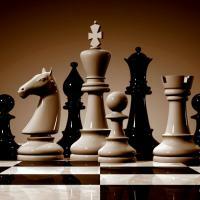 On Sunday July 1, fourteen players participated in the Sarasota Chess Academy July Open. Jeff Ward won the tournament with a perfect score of 4 out of 4. Jeff had not played regular games over the board for over 2 years but often plays online on chess.com. Although his play was a bit rusty at times, he overplayed his opponents each time again under time pressure. Because of his tournament victory Jeff sees his regular rating improve from 2069 to 2084, a new all-time high for Jeff. So, for all players who are sitting on the bench because they are afraid to lose rating points, Jeff provided a good strategy to reenter: play online to get tactically sharp again and then pick up over the board games again. We have purchased a batch of Gold (full access) ChessKid.com memberships that we are able to assign to student members that are interested in using them. The regular free memberships let you play other kids online, and the gold memberships provide great learning and training material including interactive lessons and videos. If you have played in one of our tournaments in the past and would like to use the great features that a full ChessKid membership offers, we can set up an account for you. If you don't use the features that a gold membership includes, we will reassign the gold status to other kids that are interested in actively using them. Your account will still be active, but just downgraded to the regular player level. Gold level can be reassigned later.